Jellyfish Entertainment, home to artists like Sung Si Kyung, Park Hyoshin, Lee Suk Hoon, Seo In Guk and VIXX, followed through with their promise. All the proceeds from their ‘Heart Project’ album, featuring Jellyfish artists, were donated to the Salvation Army Korea. Not only was the album created as a Christmas present for their fans, but it will now benefit those in need as well. Singer Seo In Guk and idol group VIXX even took part in the Salvation Army kettle project, where fans could donate on a designated day with their favorite star running the kettle donations. Then one special fan was chosen to win a personal prize from the star himself. 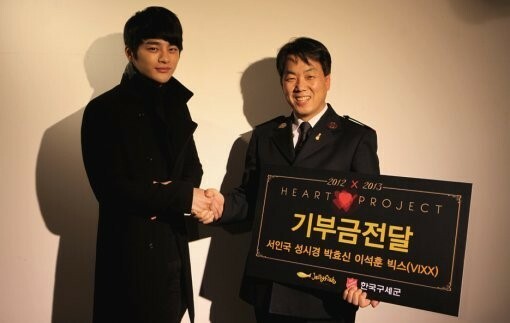 Seo In Guk’s kettle date, December 11th, achieved the biggest record with the most fans showing up to donate. VIXX had their turn on December 14th, as the 2012 Goodwill Ambassadors for the Salvation Army to boot.